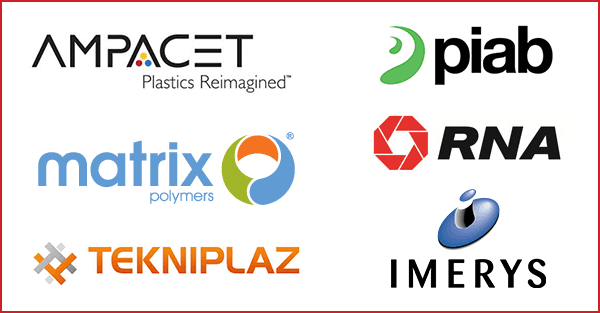 All of these new partners stay true to PlastikCity’s principle of only partnering UK & Ireland based companies with high quality equipment and services. – Ampacet is the expert in masterbatch solutions, with 25 manufacturing sites located in 17 countries all over the world. They join PlastikCity in Masterbatch & Additives. – Imerys is the UK’s only polyolefin recycler with EUCertPlas accreditation. Class leading product development facilities allow them to produce technical compounds for engineered applications. They join PlastikCity in Recycled Material. – Matrix Polymers has grown organically and by acquisitions over 23 years to become one of the world’s leading suppliers of raw materials to the rotomoulding industry. They join PlastikCity in Rotomoulding Material. – Piab provides smart solutions for the automated world. Their vision is to become the global leader in gripping and moving solutions. They join PlastikCity in Vacuum Components and End of Arm Tooling (EOAT). – RNA Automation operate in the area of specialised automation engineering, providing bespoke automation solutions for advanced manufacturing industries. They join PlastikCity in Automation Systems and Industrial 6-axis & Collaborative Robots. – Tekniplaz are a technical centre of excellence in the design and development of precision plastic injection-moulded products. Decades of experience in the Tekniplaz team means they have developed components and tooling for almost every sector. They join PlastikCity in Mould Services. If you’re not already a partner and you want to promote your company to the UK plastics market, email PlastikCity or call them on 01455 209270.